There are 31 basic Elements of Meaning (not counting the numerals), which correspond to an alphabet, except that each element also represents a fundamental concept. Each basic concept becomes a building block to formulate miniature word definitions. So an aUI word can give you clues about what it refers to if you know the building blocks in its formula. As noted in the Introduction, the aUI elements propose to represent meaning at an 'atomic', indivisible level, and provide an 'alphabet for human thought' (Leibniz). 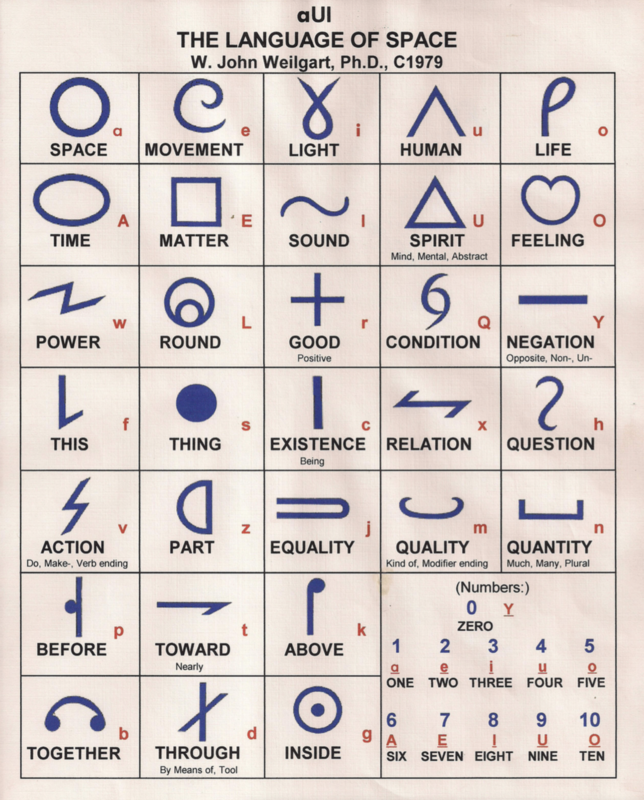 Additionally, they are designed with an internal, iconic relationship between sound, symbol, and meaning. The aUI-to-English part of the dictionary is arranged alphabetically according to the order below. Capital vowels are pronounced with elongation mainly in time, that is they are similar phonetically as the lower case vowels, but held longer. The vowels with carets are transcriptions of numerals that are pronounced as nasalized vowels. The Ø was formerly transcribed as Q for lack of a better English letter, but it corresponds in pronunciation to that Scandinavian letter (or to the German Ö or Latin œ, as in 'word' but with rounded lips).